I went to an event at The Queen Elizabeth Hall yesterday, at the Southbank Centre in London. It was part of the WOW Festival and featured the premiere of a documentary film on Alice Walker, Beauty In Truth. Following the film was a Q&A with Alice Walker and the director of the film, Pratibha Pramar. It was a great film about a truly inspiring woman and a reminder of a great, now ageing, generation of activists who changed the world. 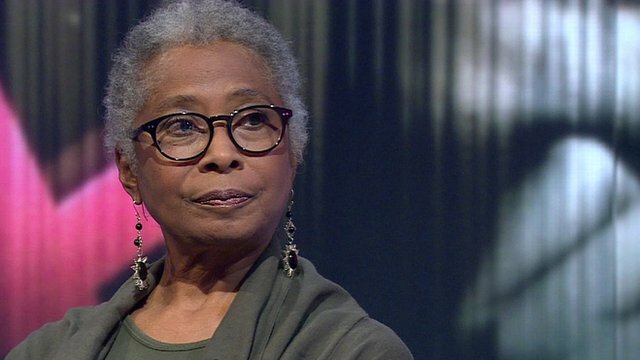 I cannot encourage you enough to explore the writings of Alice Walker if you are not familiar with them – most of us have read or know of The Colour Purple but Alice Walker’s world view encompasses a wider spectrum that that of Black America alone. Agree or disagree, with what she is, says and creates, she always embodies something to make you think and think again. How fantastic a quality is that? Style, for me, is as much about intellect as it is anything and Alice Walker is truly inspirational. And so our mothers and grandmothers have, more often than not anonymously, handed on the creative spark, the seed of the flower they themselves never hoped to see – or like a sealed letter they could not plainly read. It was a great evening. D&I were struck, having also watched a really good documentary on Harry Belafonte a few weeks back, how this specific generation of Black Americans truly live and breathe their activism. Not entirely surprising that they would but truly energising and uplifting. I really feel that they, and their achievements, will stand as great figures in history as time passes. Alice Walker defined herself as a feminist and a woman of colour, flawed as we all are but constantly striving to create a better world. It seems a noble endeavour to be a part of.